Ronald G. Schwartz, M.D., M.S. Dr. SChwartz is Professor of Medicine and Imaging Sciences and an Attending Cardiologist. He serves as Director of Nuclear Cardiology and Cardiac PET CT at URMC. Dr. Schwartz is an active clinical cardiologist with special interests in nutrition, lipid management and exercise. 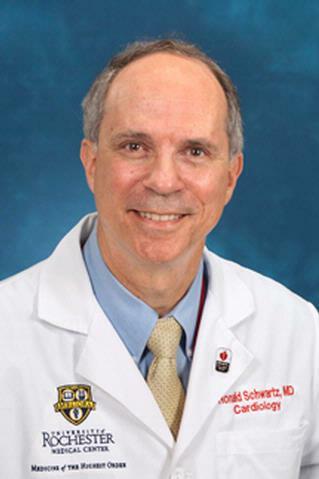 Dr. Schwartz takes care of patients with cardiovascular diseases who are admitted to Strong Memorial Hospital, and he sees outpatients with cardiovascular disease at the Clinton Crossings Clinic. He is board certified in Internal Medicine, Cardiovascular Disease and Nuclear Medicine. Dr. Schwartz completed his undergraduate and medical degrees at the University of Rochester. He earned the MS Degree in Human Nutrition from Columbia University, and performed his Masters thesis research on diet and heart disease at Hebrew University in Jerusalem. His residency training in internal medicine was completed at the Hennepin County Medical Center of the University of Minnesota. His cardiology, nuclear cardiology and nuclear medicine training were completed at Yale University. He is a Founding Member of the American Society of Nuclear Cardiology and is Past President of the Cardiovascular Council of the Society of Nuclear Medicine and Molecular Imaging. His research interests involve optimizing nutritional, lifestyle and medical treatments of coronary heart disease. Ronald G. Schwartz MD MS FACC FAHA ABNM FASNC is Professor of Medicine and Imaging Sciences and is attending in Cardiovascular Medicine, Imaging and Disease Prevention. He serves as Director of Nuclear Cardiology at URMC and Clinton Crossings, and of Cardiac PET CT at Science Park. Dr. Schwartz is an active clinical cardiologist with special interests in nutrition, lipid management and exercise. Dr. Schwartz is a native of Fort Worth, Texas, grew up in White Plains, NY and completed his undergraduate and medical degrees at the University of Rochester. He earned the MS Degree in Human Nutrition from Columbia University, and performed his Masters thesis research on diet and heart disease at Hebrew University in Jerusalem. His residency training in internal medicine was completed at the Hennepin County Medical Center of the University of Minnesota. His cardiology, nuclear cardiology and nuclear medicine training were completed at Yale University. Bansal S, Wackers FJTh, Inzucchi SE, et al. "Five-Year Outcomes in High-Risk Participants in the Detection of Ischemia in Asymptomatic Diabetics (DIAD) Study: A Post-Hoc Analysis." Diabetes Care. 2011; 34: 204-209. Adams MJ, Dozier A, Shore RE, Lipshultz SE, Schwartz RG, Constine LS, Pearson TA , Stovall M, Winters P, Fisher SG. "Breast Cancer Risk 55+ Years after Irradiation for an Enlarged Thymus and Its Implications for Early Childhood Medical Irradiation Today." Cancer Epidemiol Biomarkers Prev. 2010; 19(1): 48-58. Adams MJ, Shore RE, Dozier A, Lipshultz SE, Schwartz RG, Constine LS, Pearson TA, Stovall M, Thevenent-Morrison K, Fisher SG. "Thyroid Cancer Risk 40+ Years after Irradiation for an Enlarged Thymus: An Update of the Hempelmann Cohort." Rad Research. 2010; 174: 753–762. Chapter Title: Cardiotoxic Effects of Radiation Therapy in Hodgkin's Lymphoma and Breast Cancer Survivors and the Potential Mitigating Effects of Exercise. Medical Radiology, 2008, 103-115. Author List: Mustian KM; Adams MJ; Schwartz RG; Lipshultz SE; Constine LS. Book Title: Current Cardiology Reports 2006; 8: 139-146. Author List: Kudes M, Schwartz RG. Chapter Title: The Metabolic Syndrome: A Quick Primer. Book Title: Lipid Letter 2003; 2(3):4-5.